I'm just so thankful to all of you who stop by to read, look, comment, well wish, inspire, etc... This blog 'aint no flippant thing for me. When I started it I guess you could almost say it was my distress call, my S.O.S. And all of you have answered the call and I'm truly grateful. And super duper thanks to all of you who sent hopes, prayers, and all around good energy for my brother Jason. He's thankful for you guys as well! As me and Aar were peeling potatoes last night we had on the Food Network. Man, I'm a foody! With the TV writer's strike in full swing , I think we'll exclusively watch Food Network right through the new year. Aaron is almost in tears without Letterman and Conan so we'll have to make do with Bobby Flay and Mario Batali. I'll post over the weekend...hopefully with some new holiday artwork to display. We've got all the blueprints but turning those into finished products is the real challenge! I hope everyone has to pop the top button today! Heck, I hope you have to change into a pair of sweatpants! Thanks so much again for paging through the artful book of life with me! Happy Thanksgiving!!! Aaron sends lots of love too! I love you guys and can't wait to see what fabulous creations Christmas will bring from you two! Oh yeah, Aaron- I watched Conan fo r the first time last night. He did a skit from a wine tasting he went to. I laughed so hard I thought I was so going to throw up!! 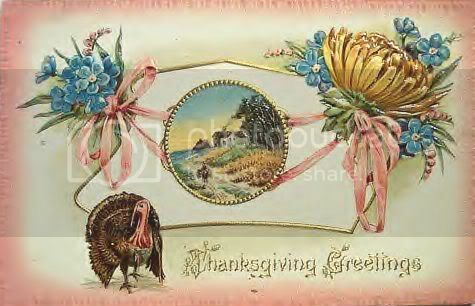 Happy Thanksgiving to you and your family. Have a wonderful day!!! Have a wonderful day Jenny!!! Hope you all had a great turkey day!!!! now it's time to go shoppin!! Hi Jenny! Happy Thanksgiving!! I am definitely thankful for all my blog and flickr friends- thank you for being one of them!! I've been enjoying your blog and would like to invite you over to mine to join our virtual cookie exchange! Happy Belated Thanksgiving to you Miss Jenny and Aaron! Guess who's flying to New Jersey real soon? ?